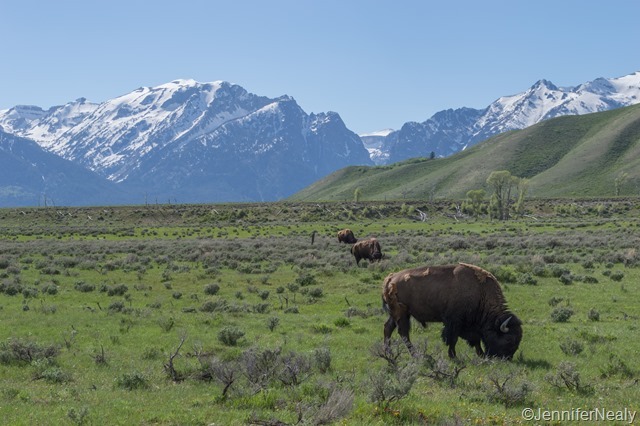 I think the best way to describe our 9 days in Grand Teton would be to call it a wildlife extravaganza! 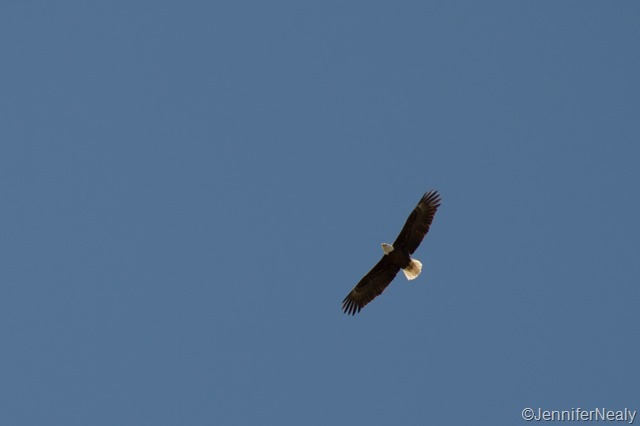 We had heard that early spring was a great time for wildlife viewing, and we were not disappointed. 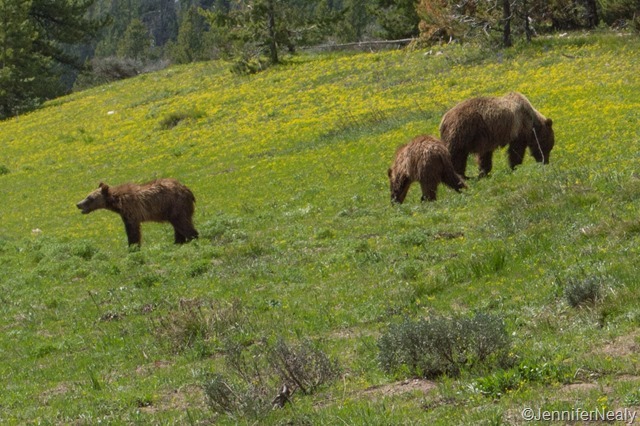 One of the things I wanted to see most was a grizzly bear. We used to see black bear all the time at our mountain house in Georgia, but I had never seen a grizzly before. 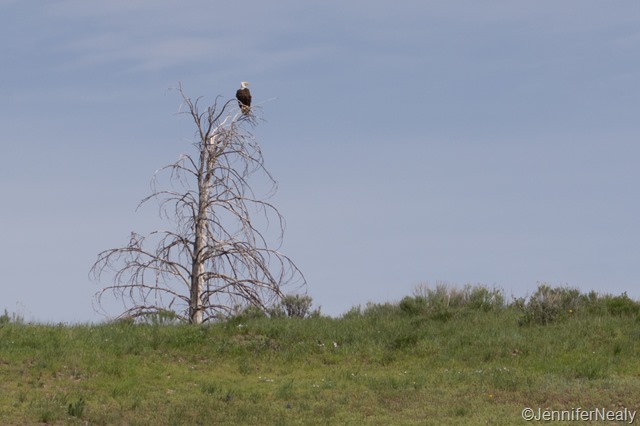 My hopes came true and then some – we saw the same bear three different times! The first time we saw her, we initially saw the tell-tale sign of a wildlife spotting: lots of cars parked on the shoulder of the road. 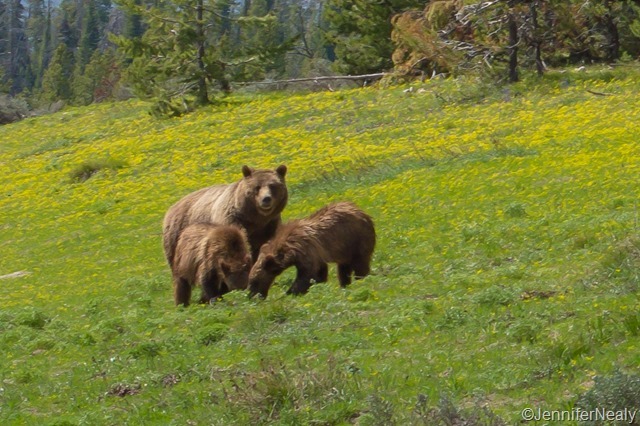 We parked and ran up to the crowd as fast as we could, just in time to see a momma grizzly and her two yearling cubs. She was a good distance away, and my pictures were all pretty blurry and not too good. But I was just excited to have seen her! I noticed that there were several professional photographers there with gigantic zoom lenses, and we started talking to a couple of them and got some interesting information. The bear we had just seen is knows as Bear 399, and she is a very popular bear. She’s produced several offspring over the years, and she has a tendency to hang out close to the road. 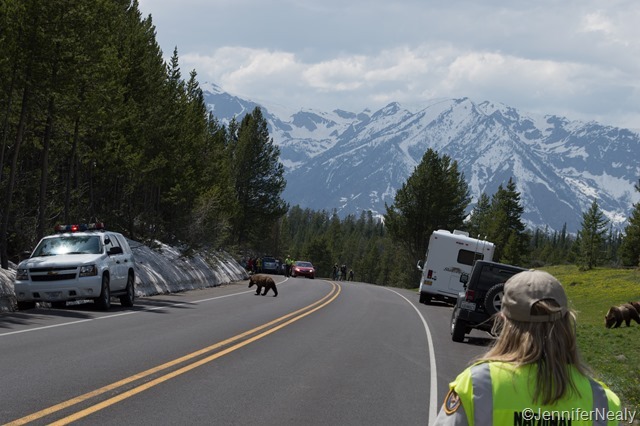 The theory is that she feels safer there with her babies because the male grizzlies don’t like to come close to the road. She’s very calm around people and thus has been photographed a lot. One article I read referred to her as “the Angelina Jolie” of bears because of how often she is photographed. 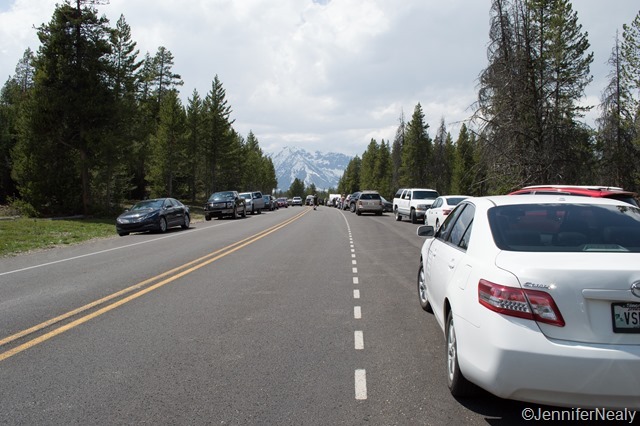 A couple of days later, we drove down the same stretch of road, and once again saw the cars on the shoulder. 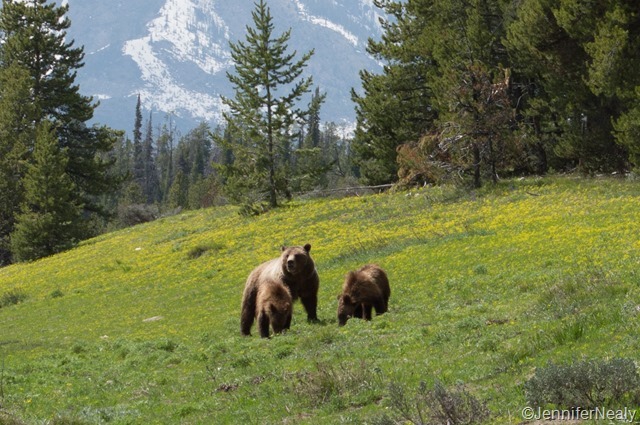 I grabbed my camera and ran, and then couldn’t believe my eyes – once I got to the front of the crowd, I was a mere 100 feet from Bear 399 and her cubs. And this time I was lucky enough to get some great pictures! I couldn’t believe how calm this bear was even with all of the people standing around staring at her. There were a couple of rangers there making sure no one got too close to her. As she and the cubs were happily munching on the grass, they would occasionally start moving towards the crowd of people, and the ranger would have us all back up. One of her cubs even got a little bold and walked right across the street! He returned back to mom a few moments later, and then they all 3 ambled back into the trees. The cubs are yearlings, and mom is expected to kick them to the curb later this summer. The other animal I was hoping to see was a moose. We saw several during the week, but I never got a really good picture until our last day. We were enjoying a couple of beers at Dornan’s, a restaurant within the park, and this big guy was just hanging out right behind the restaurant. We saw lots and lots and lots of bison. They were pretty much everywhere, including in the campground. 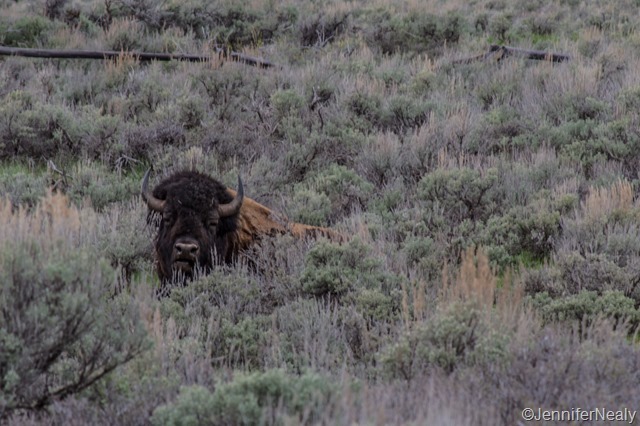 This guy was just hanging out in one of the campsites, which was fortunately unoccupied at the time. I mentioned in my last post that we would sometimes walk the dogs down the gravel roads in the park. 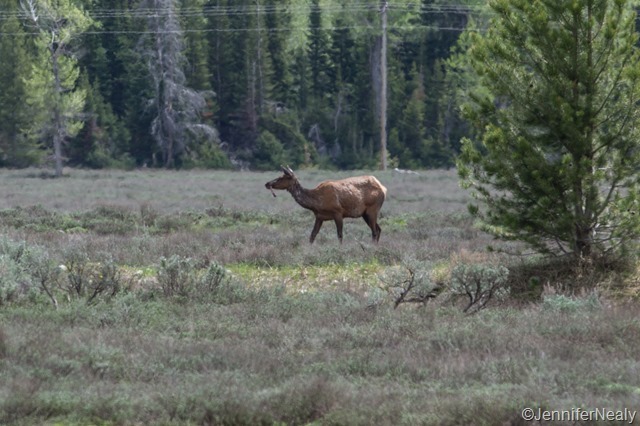 One afternoon as we were doing this, a car stopped and two women excitedly told us that they had just seen an elk give birth in the meadow. We thought that sounded pretty amazing, but we weren’t sure exactly where they had seen it. After we walked a little further down the road, we saw a couple with a large camera and a spotting scope both aimed out into the meadow. Lucky for us they had spotted the elk also and allowed us to look through the scope. They even let me put my camera on their big zoom lens to get a couple of better pictures – how nice was that?! As we watched her through the scope and camera, we could tell she was eating something. 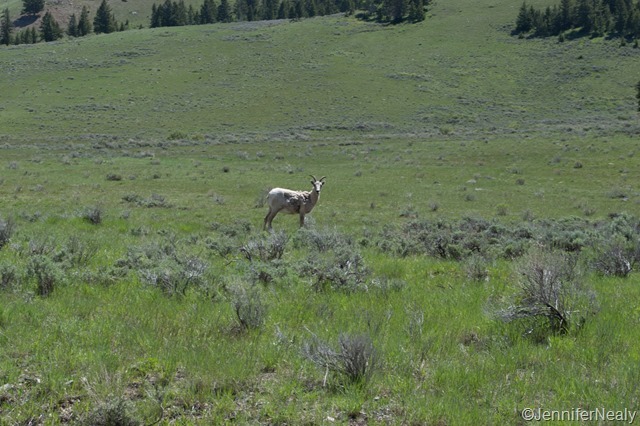 Apparently the momma elk eats the afterbirth after the baby is born. Eww, right? But it was still very interesting to witness. And after a few minutes, we finally saw the little baby pop up on his wobbly legs and walk towards momma, where he started to nurse. Amazing. But our wildlife spottings didn’t stop there! 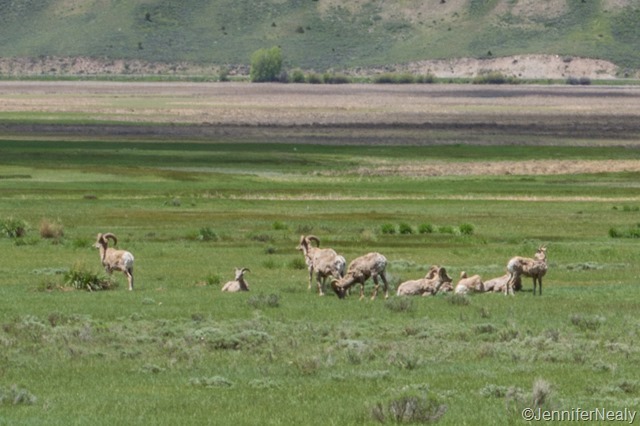 We saw pronghorn antelope, big horn sheep, bald eagles, and mountain goats. I think we saw something interesting every single day! It was a fantastic week. We definitely hit the wildlife jackpot! We’re in Yellowstone now, hoping to see some wolves this week! Incredible! I so want to go there! Love living vicariously through you! Oh, yes, this was most definitely a fantastic visit. So glad you got to see the grizzly family. It is awesome to have this experience. You hit the jackpot with all these sightings. Thanks for sharing!! 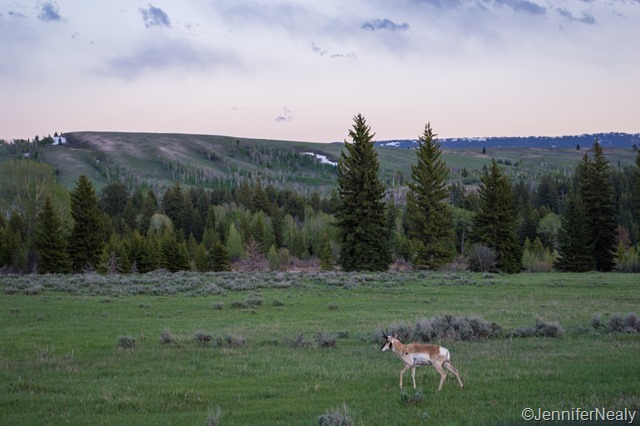 I couldn’t believe our good luck – and so far we’re having pretty good luck in Yellowstone too! I’m so excited to go there in 2 weeks. I hope I have half of your luck! I hope you do too! Can’t wait to hear about your visit! 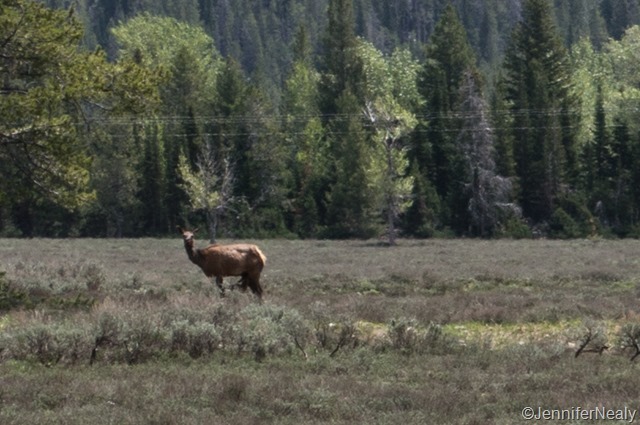 We’re in Yellowstone now – a ranger told me a couple of days ago that they think there are maybe only 12 moose in Yellowstone! We did see one when we drove out the northeast entrance a couple of days ago, but that’s it. I bet you have some great stories from your time working here! Incredible!! Love all the pictures. Amazing capture of the mom and her cubs. What a special encounter. Nice to hear you’re finding spots to walk the doggies too. Wonderful photos. When we lived in Utah, we went up to Yellowstone several tomes each year. Amazing place. We saw lots of animals, but no grizzlies. We saw one once in Glacier – a little bit after the hiker bus dropped us off for the 18 mile Garden Wall hike. It was nerve racking, but an awesome encounter. So glad you got to see so many animals. Thanks for sharing. What amazing luck you had! 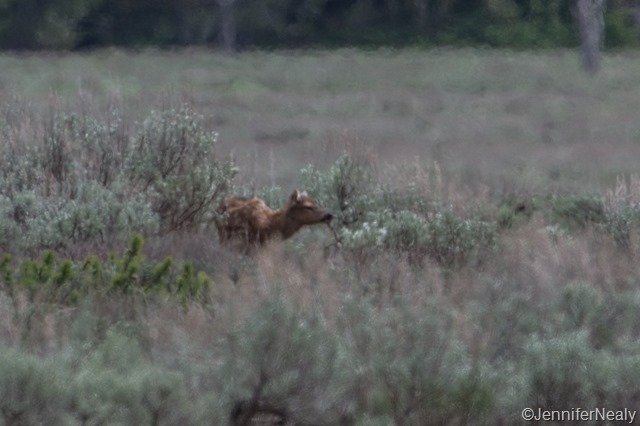 How nice the photographers let you hop in on the elk sighting like that. 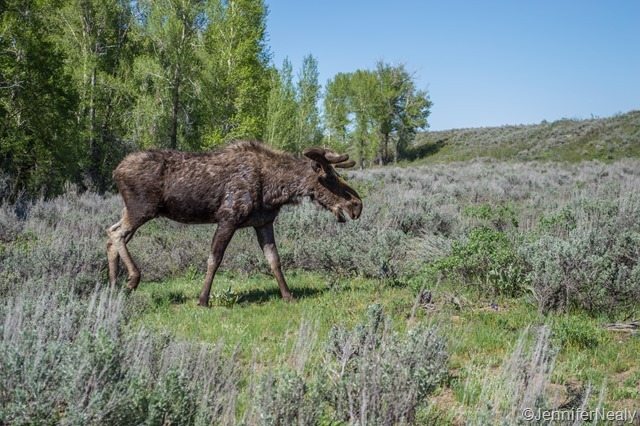 We saw lots of moose while in the Tetons but not one bear or wolf there or in Yellowstone.